This is an excellent book on caricature by caricaturist and illustrator Tom Richmond. 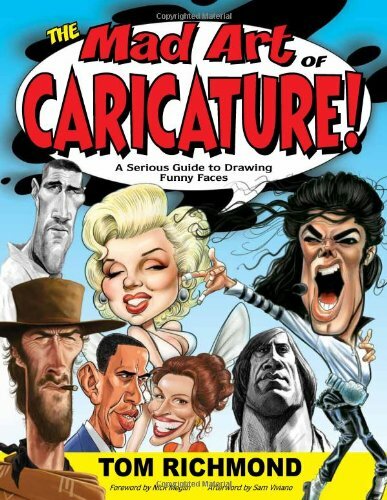 There are few artists who are more qualified to write a book on drawing caricatures. Over the years, he has drawn for many print media, especially for MAD magazine which is known for its art. To get the best out of this book, you should already know how to draw basic portraits. This book gives you the tips and techniques to add to your knowledge of portrait drawing to create the caricatures. There are enlightening drawing tips on every page from the start till the last page, accompanied by lots of amazingly drawn examples. It teaches you how to push the limit of drawing facial expressions without sacrificing likeness to the character. You'll learn how to modify head shapes, enhance features, put in expressions and more. It also covers a bit on body postures. Towards the end there's a section on drawing live caricatures. The very last section looks at the caricatures from MAD magazine and includes the process of working from start to finish. This book is packed with tons of information and is most highly recommended. 5 out of 5 stars with funny faces.